If you ask this reviewer, Ice Cube's solo career remains the best of the N.W.A. collective (which included Dr. Dre, Eazy-E, MC Ren, and Ice Cube). After all these years, "AmeriKKKa's Most Wanted" sounds just as raw as the day it was released. The album dropped one year after the landmark album "Straight Outta Compton", and builds on the political and cultural commentary, bringing it to a higher level. Ice Cube holds absolutely nothing back on his solo debut. His unapologetic lyrics touch on several topics; including street life, gangs, drugs, kids, a woman's place in the hip-hop world, and politics (among others). 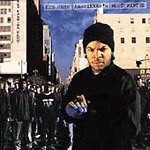 Standouts include the riveting title cut, the hilarious story-telling of "You Can't Fade Me", the enthralling production of "JD's Gafflin'", "A Gangster's Fairy Tale" where Ice Cube talks to the kids, "Endangered Species (Tales From The Darkside)" featuring Chuck D from Public Enemy, "Who's The Mack? ", and the interesting commentary about a woman's place in hip-hop "It's A Man's World" featuring (female emcee) Yo-Yo. Overall, those who thought Dr. Dre's "The Chronic" was the best thing to come out of the N.W.A. collective should check this out. If you think "The Chronic" is slightly overrated (like myself), you should definitely check this out. Don't be caught sleeping.